For the third time in 2012, Roger Federer beat young Canadian superstar Milos Raonic in a close three-set match that saw Federer need to come from behind. As expected, it was a serve dominated affair, with only one break of serve throughout the contest, and once again it came down to the final few points to decide it. The first set, almost inevitably, ended in a tiebreak, as it has so often when these two play this year. (They have played 4 tiebreaks including this match.) Raonic got the edge at when he got the mini-break at 3-2, and he did not relinquish his lead from there, and closed the set 7 points to 4. Immediately into the second set, Roger broke the big man's serve and that's all he needed as he held out from there to take the set 6-4. The third set, once again, almost inevitably, went into a tiebreak, where Roger got the mini-break at 2-2. That would prove to be all the opening he needed as he got another mini-break at 5-2, which brought him to 6-3 after a Raonic ace, and Roger converted on his second chance to win by putting away an easy backhand volley into the open court. Fed won 67(4) 64 76(3) in one hour and fifty nine minutes. Federer did not face a break point the entire match. Once again, both Federer and Raonic played very well. They seem to be a perfect fit for each other in terms of putting on quality matches. There's no doubt that Fed enjoys facing the challenge of playing a big server, as it makes him focus much more intently on his own service games, knowing that if he gets broken, he likely loses the set. Statistically, it was a great match from Roger. He served at 69% while not facing a break point and won 82% of his first serve points and a whopping 83% on the second serve! Raonic served an incredible 25 aces (to Fed's 9) wile serving at 66%, but he only won 53% of the points on his second serve, which might have ended up costing him in the end. Rafa Nadal lost in straight sets to defending champion Philipp Kohlschreiber 63 64. I knew Kohl would be a dangerous opponent and I was not wrong. He was strong from start to finish and did not get broken once despite the fact that he only made 50% of his first serves. In my view, it was a mistake for Rafa to play in Halle, since the court is very quick and he really only came for the money, which should be no reason to play a tournament, if you ask me. It is obvious that he is physically and mentally drained after the long clay court season. For him and his fans' sake, I hope that his tank isn't empty to play his best at Wimbledon. The bigger upset than Nadal losing to Kohlschreiber was 34 year-old Tommy Haas beating Tomas Berdych 64 36 75. The former World #2 has been in very good form recently, beating the #5 Tsonga in Munich and making a 3rd round run at Roland Garros, where he had to win three qualifying matches just to get into the event. I really enjoy watching Tommy play, so it's inspring to see him play so well for his age. He is only 19 match wins away from 500, and has aspirations to win another title. The semifinal matches are Federer vs Youzhny (who beat Stepanek in 3) and Kohlshreiber vs Haas. 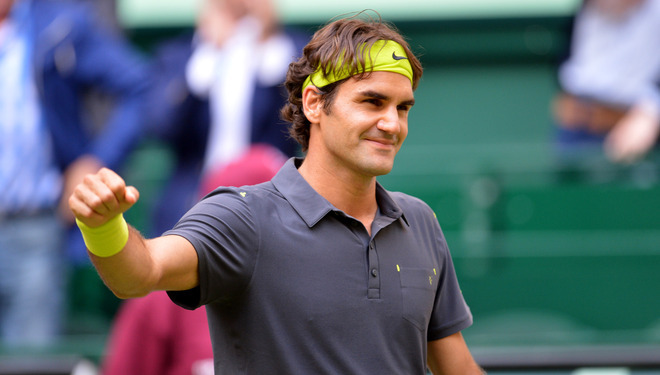 Expect Federer and Kohlschreiber to both win in straight sets. Both Youzhny and Haas have been playing very well but Fed and Kohli have been better, and are much fresher. Fed is a combined 28-2 vs Youzhny (12-0), Haas (10-2), and Kohlschreiber (6-0), so he has certainly become the overwhelming favourite with the departures of Nadal and Berdych. He will still have two tough matches to win however, and you know he will stay sharp. Two matches for title #75!